Cooking with Yucca — Dine on In! The newest "non grain" on the block is the yuca. Have you had it? It's this ugly, tree looking branch that has this gooey, non startchy fruit inside that is almost remniscisnt of a potato and my newest pizza and bread dough. I heard about it a while ago when researching Latin American recipes (they refer to it as Cassava) and was curious to try it after the Paleo bloggers cheered about it. Funny, something that is so indigenous to others is so foreign to us, The Americans. The yuca root. Halved and boiled. Ready to eat. The steps aren't too complicated. In fact, they are just like a French Pate Choux pastry dough. Flour (yuca), butter (I guess you can use a butter alternative if you're vegan), Salt, Water, and Eggs. It's a pretty fool proof recipe. I now know why it's all the rage. The hard part is boiling the yuca. I found it best to keep the skin on while boiling. It's a short cut. I like shot cuts. (NOTE: The water becomes really slim like and gritty- so make sure you wash your pot really well afterwards or you could wind up with this film on your pot that is unpleasant). 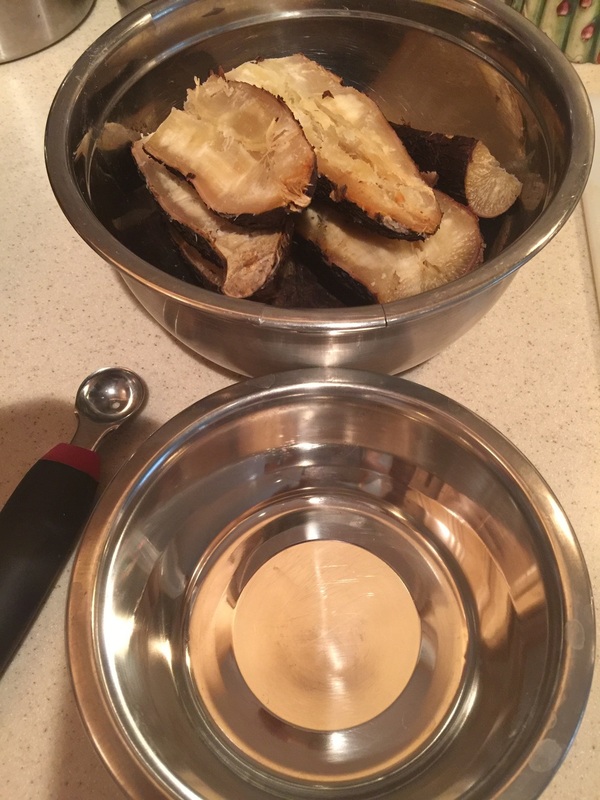 Use a Melon Baller to scrap the flesh onto a bowl. After I boiled the half pieces, I scraped the flesh out with a melon baller. This was just a tool I had laying around so I used it. But the flesh is pliable enough to use a spoon; so if you don't have a melon baller- don't go out and get one; just use your spoon. Added yuca, baking soda, salt, (coconut sprinkles [optional] and pulsed away. The food processor made it pretty easy. My 1st variation contained coconut sprinkles (about 1/3 cup). It was an adaptation from a paleo blogger, but I omitted them from the final product because we were looking for a dough texture and taste. Try them both and see what you think! Eggs up next- Pulse again. I tried 4 different options with the dough. (Sorry, ate them so fast- a girls gotta do what a girls gotta do for the sake of food). I rolled a piece out very thin like and made crackers to eat with our tomato jam. I also rolled them into little balls and stuffed them with cheese for some yummy "pan de yuca" appetizers. (These could have been dangerous- as I could of eaten them all). I also cut them like a biscuit. In then end, I had enough left over to also try out either a pizza or a pie dough. I chose a pie. (Cooking TIP: roll in between two sheets of plastic wrap. 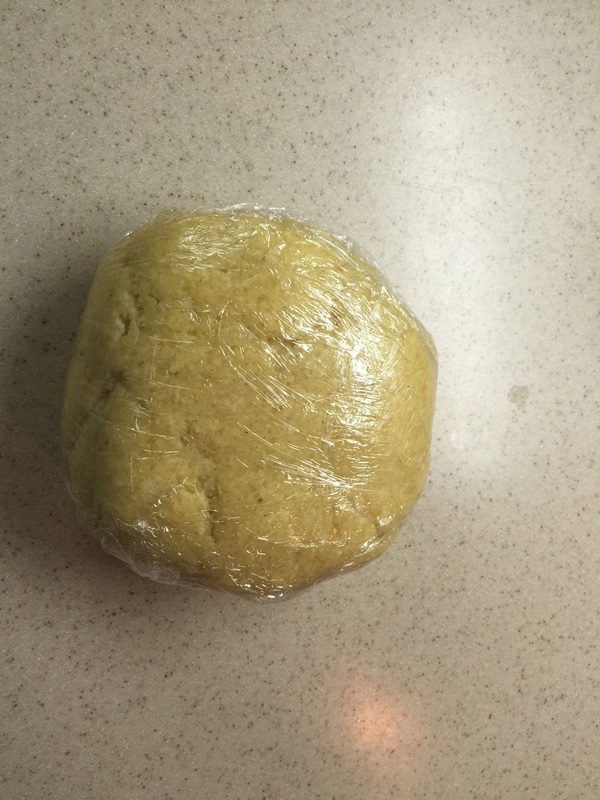 Since it doesn't contain gluten, the "dough" is tacky- the plastic wrap keeps it nice and makes it easy to roll). Roll out the yucca dough between two sheets of plastic wrap (or just add one more since you already have it wrap in your fridge). (Remember, the dough is tacky since is doesn't contain any gluten so having it between the wraps keep it easy to roll). Roll onto the pie pan. 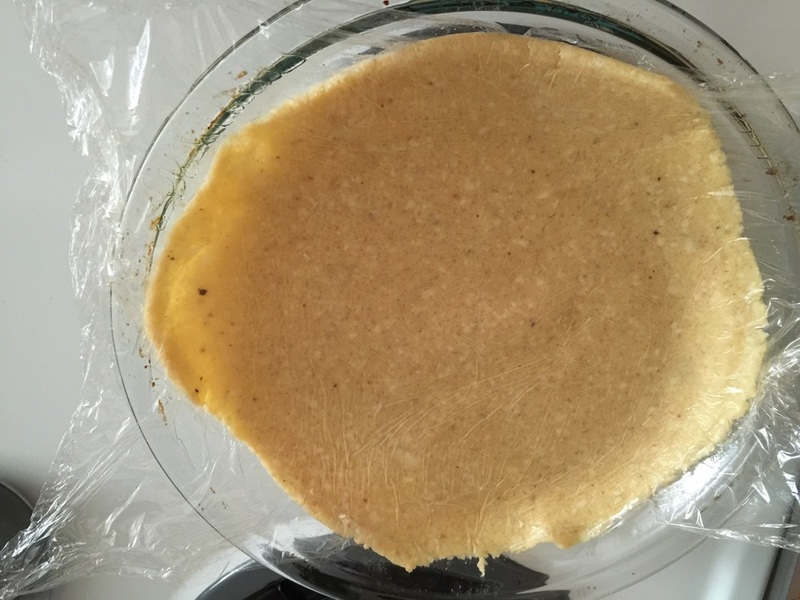 Once you've rolled it remove one piece of the plastic wrap, and roll onto the pie pan. Don't worry it you got some overhang, you can trim it off if you want. Remove the other side of the plastic and get ready to pile on the topping to make a gluten free pizza. Like what you're reading so far? If so, make sure you subscribe. It's the best place to get cooking tips, invites, and special offers to subscribers.